An Animal Bridge is a structure that provides animals a way to roam around their habitat more easily. Humans have built sprawling communities all over the world and this has affected forests badly. These animal bridges are also known as wildlife crossings or wildlife overpasses and they serve the purpose of solving a problem called habitat fragmentation to an extent. By using these crossings, animal can move freely without having to cross huge and dangerous man made alterations. Every day more animals are getting killed by cars and the death toll crosses millions every year. There are more than 600 tunnels that have been installed under roadways in order to help animals roam around. The longest ever animal crossing was made for the European badger and it measures 800 meters. A massive animal bridge was created in Banff national Park over the Trans-Canada Highway to protect the park’s animals. Highway fencing in this national park has reduced wildlife-vehicle collisions by more than 80%. There are a total of twenty four wildlife crossings in Banff national Park alone. According to several studies, the monetary cost is greatly outweighed by the benefit to the animals that use these crossings. One of the most common types of animal crossings is an underpass. All these crossings consist of a ‘learning curve’ for the animals to begin using them after construction. Declan, Tobin. " 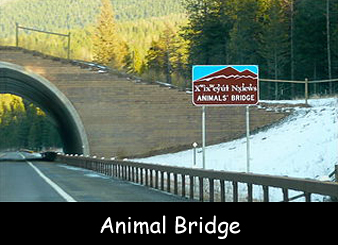 Animal Bridge Facts for Kids ." Easy Science for Kids, Apr 2019. Web. 25 Apr 2019. < https://easyscienceforkids.com/animal-bridge/ >.